This article talks explains the concept of safety factor and how it is calculated. It’s a fundamental notion that every mechanical engineer have to understand well. How do I know if the design of my part is « safe » enough? That’s a difficult question that many designers asked themselves. One of the potential answers involves the measure of the safety factor. For certain people, this notion is still not well understood, so I decided to write about it! FEA simulation helps to understands why a design fails, where it failed and how to improve it. That’s why FEA is so important for companies who design products. To assess the safety of a design, designers need a simple factor which will help in understanding if a design is safe enough. This factor is called the safety factor. The definition of the safety factor is simple. It is defined as the ratio between the strength of the material and the maximum stress in the part. What it tells us basically is that in a specific area of the model, the stress is higher than the strength the material can bear. When the stress in the model remains much inferior to the strength of the material, the safety factor stays superior to 1 and the model is « safe ». Keep in mind that if the safety factor is way superior to 1 everywhere in your model, this is also indicating that your part may be over-engineered. In this case, this is not desirable either, because you are just wasting material resources and increasing the cost. If you still have some doubts about that, no shame, it’s not a concept easy to grasp for beginners, but it is an essential one. In short, stress is a value that mesure the inner pressure inside a solid which is cause by an external loading. If stress is too high inside a part, the part may fail. The notion of stress is not so different with what we experience everyday at work… When we receive a load of work, we become stressed. If we are too stressed, we may experience a nervous breakdown and many health problems. If you want to understand more about stress and how stress is actually calculated, I wrote a full article about that few months ago. What is the strength of a material? Stress and Strength are different and that’s where many people don’t get it. Stress in a body is always a function of the applied loading and cross-section, whereas strength is an inherent property of the body’s material/ manufacturing process. Strength is obtained similarly to other material properties, by doing for example a standard tensile test which subjects a sample bar to uniaxial stress. Then we can draw the material stress-strain curve by extracting the deformation data and plotting it in function of the load data. The point E is the elastic limit. The material will continue to behave elastically up to point E, but stress and strain won’t be proportional anymore. The point U indicates the maximum stress that can be achieved by the material. It corresponds to its ultimate or tensile strength. The point F is the fracture point. Note that the points E and Y may coincide for some types of materials such as ferrous materials. Y is considered to be the intersection of an offset line, parallel to the linear portion of the stress-strain curve typically at 0.002 axial strain, and the plastic portion of the curve. As you read, there are several material strength values: the yield strength, the ultimate strength and the fracture strength. The safety factor is calculated with the yield strength so this is the parameter you need to know in priority. Is this ratio a perfect indicator of a model safety? That’s why it’s always better to consider a safety factor which is not exactly 1, but maybe a little higher (2-3) depending on the hypothesis you take. Additional note: The safety factor only describe material failure. In some designs, it is sufficient, but if you are designing a slender element some form of stability failure (i.e. buckling) may occur. Such safety factor do not take that into account since buckling can happen when stress is much smaller than limit stress of the material. There is no set ‘safety factor’ as such. That is too simple a concept as there are many modes of failure. There are instances, for example, where stresses above yield are acceptable. You should really refer to the appropriate design standard for the structure, its use, and the classification of the stresses. Safety Factors are not necessarily max stress/yield. Many times the industry you work in will dictate how you calculate design safety factors. More often than not fatigue is your biggest problem not yield. In my opinion, safety factors are really only important in certain cases. In the industries that I’ve worked in (shipbuilding/offshore) safety factors are hardly the criteria we work to. We do have our allowable stresses, but safety factors never govern because there are always stress concentrations that are allowed to be waived because of the geometry, mesh size/aspect ratio, loading conditions, etc. The only real place where safety factors absolutely drive the design is in lifting applications where you need a SF of 3 to 5. That said, it’s always a good thing to check, especially if you’re doing approximate hand calculations. It is best to understand what a safety factor really is and understand what the requirements actually state. In general, the ultimate safety factor is Ultimate load/applied load, and for yield SF is Yield load/applied load. Stresses may not be linearly related to the load due to local plasticity effects. Static preloads may receive no safety or a small one depending on requirements for uncertainties. In evaluating the possible ultimate loads/stresses people frequently look for quasi-static or steady-state conditions with extreme overload or bias. In real service/ life it typically happens under drastic change of loading – in dynamics, say, vehicle impacting a road obstacle or bump, or seismic loading on a structure, explosion, etc.. That’s where FEA can really help to replace difficult and expensive testing. I think safety factor needs to be expressed with respect to something. For a one time use, it can be with respect to ultimate strength. Similarly, for many cycles, it can be expressed with respect to the fatigue limit strength. Do you like this article? Was it useful for you to understand the concept of safety factor? If it was useful and you think that others can benefit for it, can I ask you to share it with your network on Linkedin or facebook? Also, don’t hesitate to write me a comment, so I know it was useful for you and let me know what else you would like to learn about more in details! 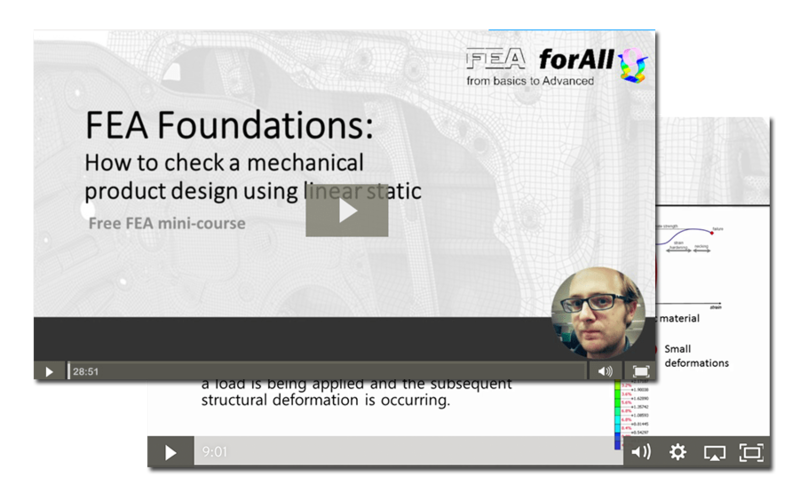 If you are a beginner in FEA simulation, read this article. It very interesting and easy to understand. What your article do not touch enough is when we have overstressed area in the part. How big those can be and element can be cosiderred safe? How big the stress can be in those areas but the part can still considered safe? In the FEA analysis it is very rare the situation when the entire part stress is below yielding point. This is the hardest part in analysis of the model, to know house far you can go and to keep the model in the safety limits. Thank you for you article and a very nice Holidays. The stress and strain must be of the same type and unit and must be referring to the same (critical) point. You’re totally right. I just didn’t want to complexify the explanation, but there are more factors to take in account! Nice article in simple language! Choosing the right safety factor depends on application of the part which is being analysed and the impact that failure creates in the field. It would be nice to give more info about industry practices and standards we usually follow in choosing safety factor. Thank you in advance! Nice and informative article and also comments of experts.